In August, I visited a project working in Cumbria, Dumfries and Galloway and across the Scottish Borders. Chris Bowman and Clive Mitchelhill have been delivering fishing experiences for young people in the area for the last 12 years, and in 2005 went on to set up Borderlines as a not for profit company. Chris Bowman from Borderlines: Demonstrating how to use a sea rod before a session on the Solway FirthA great deal of their work is with schools and focuses on delivering courses and sessions that help to create respect and understanding for the local environment. Kids are taken out to do pond dipping, water quality sampling, and learn etymology through fly tying. As Chris and Clive point out, fishing is just a small part of what they do. The day I visited however they were working with the Youth Offending Team (YOT). As part of a six session course they were introducing four lads to a variety of different fishing experiences, from carp, to pike, and fly fishing, and on this particular day flounder fishing on the Solway Firth. The surrounding area is full of a variety of different waters and Chris and Clive are keen to teach young people how to appreciate and use this asset safely. After each session those involved are given information on how to take up that particular style of fishing, where to get equipment, where to fish and which angling clubs they could join in the area. 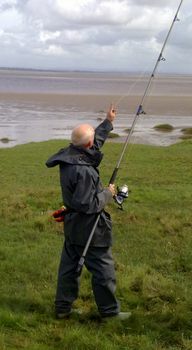 Angling encompasses a variety of different forms which are not at all similar. As many an angler will tell you, you may be a pike man or a loch hill fisher, but here at Borderlines, if you're just starting out you get to experience a range of methods. One of the supervising members of the YOT said much of what the YOT try to do is find that 'hook' which will take young people away from negative behaviour. Getting that 'buzz' from a positive activity and experiencing a sense of success and accomplishment can be part of those initial steps away from crime. For some young people this can be fishing, and introducing the lads to a whole host of different forms of fishing that can all be taken up in the local area may well increase the chance of finding that 'hook'. What struck me most about my visit to Borderlines was the way in which introducing young people to a variety of different forms of fishing in the local area could transform what may be perceived as an ‘empty landscape’ into ‘places to go’. Young people are enabled to shift their perspective by assisting them to identify safe, accessible waters, and giving them the skills and confidence to be able fish them. In this way pre-existing ‘spaces’ can be re-imagined as ‘places’ through positive activities. In case you were wondering, all the lads caught a flounder that day, and one of them even decided to take a large one home for his dinner! To find out more about Borderlines follow this link.